Tonight at the Evolution Championship Series, SuperBot Entertainment announced two more characters for PlayStation All-Stars Battle Royale's roster. The new additions should please fans of Tekken and corporate logos. The first character revealed tonight was Heihachi Mishima. Heihachi is one of the few characters to appear in every Tekken. The ruthless martial arts master is dangerous at close range. He has the potential to overwhelm opponents with quick combo moves. Toro Inoue, meanwhile, probably won't be familiar if you're not from Japan. This animated cat acts as Sony's mascot in that country. Even though he looks ridiculous, he sounds like he could be a formidable character when played right. Toro is able to switch fighting styles on the fly, allowing him to launch melee, ranged, and area-of-effect attacks. SuperBot also revealed a new stage for the game tonight. 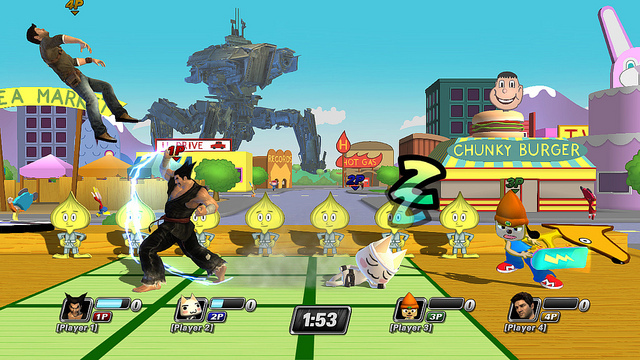 The Dojo is based on a Parappa the Rapper level. You may recall learning some moves from Chop Chop Master Onion back in the day. Like all Battle Royale maps, though, the Dojo features elements from more than one game. A mobile fortress, presumably from Killzone 3, looms in the background. The developer announced earlier today that Battle Royale will launch on October 23rd.